Although the weather does not suggest it, the long school summer holidays are on their way and so too are the Limelight Theatre Company’s summer musical workshops! 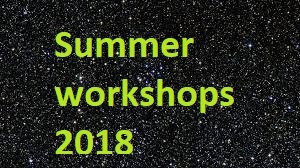 We have a selection of 2-day workshops this summer (see below) which are designed to develop students with their concentration, cooperation, communication, improve physical fitness, memory and imagination and above all have some fun too! For a small charge of £30 per day, our workshops start promptly at 10am each day and run until 3pm, with a break for lunch (please bring your own packed lunch), our Green Room Cafe will have the tuck shop open too. These workshops are open to all, you do not have to be a current member of the Limelight Theatre Company to attend, however, our members do receive a discount on the above price. The golden age of musicals gave the world some of the most memorable musicals that still remain popular today. Singin’ in the Rain, The Wizard of Oz, An American in Paris and Top Hat are just a few of the names everyone knows. Come and join this summer holiday 2-day workshop exploring some of these fabulous musicals. In this practical 2-day workshop, participants will gain tools and techniques to help them write and act scripts. Participants will learn how to generate stories, create characters, write dialogue and structure scripts. Participants will analyse and act out various scenes and librettos from plays and musicals to help them better understand how to write and act drama and musical theatre. This 2-day workshop will be led by local award-winning scriptwriter and actor James McDermott. Musical theatre is certainly having a revival at the moment, so come and join the Limelight Theatre Company to explore what is new on both Broadway and London’s West End.